Rush university is one of the biggest names in the institutes which are providing health services. Its department of Anesthesiology is specially very popular. https://www.thebestessayservice.com/writemyessay.html info for the high level of students who are looking for that kind of info. 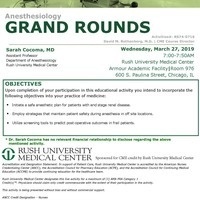 Being a student of this department, I would love to attend the event of Grand Rounds.